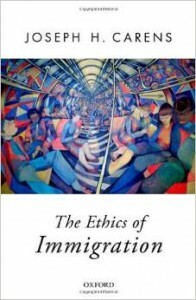 In The Ethics of Immigration, Joseph Carens synthesizes a lifetime of work to explore and illuminates one of the most pressing issues of our time. Immigration poses practical problems for western democracies and also challenges the ways in which people in democracies think about citizenship and belonging, about rights and responsibilities, and about freedom and equality. Carens begins by focusing on current immigration controversies in North America and Europe about access to citizenship, the integration of immigrants, temporary workers, irregular migrants and the admission of family members and refugees. Working within the moral framework provided by liberal democratic values, he argues that some of the practices of democratic states in these areas are morally defensible, while others need to be reformed. In the last part of the book he moves beyond the currently feasible to ask questions about immigration from a more fundamental perspective. He argues that democratic values of freedom and equality ultimately entail a commitment to open borders. Only in a world of open borders, he contends, will we live up to our most basic principles. Many will not agree with some of Carens’ claims, especially his controversial conclusion, but none will be able to dismiss his views lightly. Powerfully argued by one of the world’s leading political philosophers on the issue, The Ethics of Immigration is a landmark work on one of the most important global social trends of our era.